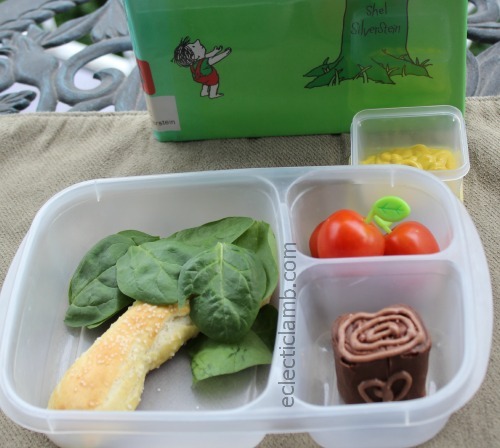 Today was Shel Silverstein’s birthday so along with some of my Bento Bloggers and Friends we are having a bento blog hop. I love The Giving Tree book so it was a natural choice for my lunch theme. My husband ate this meal. For artistic purposes it does not have a lot of food but he had several more pretzels, cheese, and yogurt on the side with this meal. It was his idea to make soft pretzels for the tree trunk. My nephews were visiting when I made the pretzels (I timed it so I would have help eating them) and one mentioned that the pretzel was bent; that was my goal. I struggled with how to make the tree stump that is found at the end of the book. Somehow I remembered Little Debbie Swiss Rolls. My grandmother who is now 97 loves them. Please click on the button below to continue on this hop to see what Venia from Organized Bites created. Love how you made the tree! You pretzel tree is perfect! We love They Giving Tree, too. Love the tree and pretzels. Very nicely done. Love the spinach tree leaves!